Bounty, Luau, Plaid and Soul Kitchen were run by Tom & Louise Boddie in Cleveland, Ohio. This discography covers the pre-1970 gospel releases (45’s and 78’s) on these labels. From 1969 onwards the first two digits of the release numbers indicate the year of release (Bounty, Plaid and Soul Kitchen). 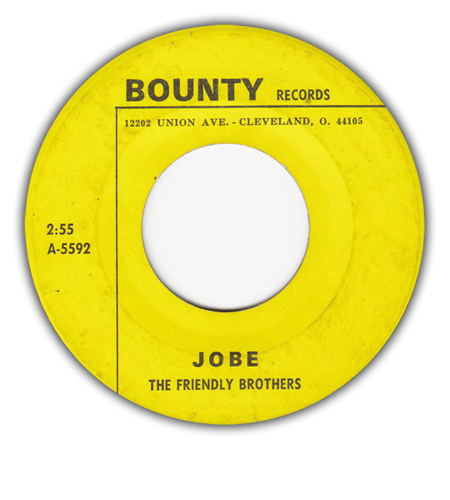 On the Bounty label (devoted to gospel from 1966 onwards), releases continued to come out until the second half of the 1980’s. Luau was in operation in 1965-1967, Plaid’s initial releases were from 1959 with a few more in 1970, one (#145) somewhere in between (?) and possibly one late release from 1977 (#7728, no gospel). Soul Kitchen started in 1967 and quit the scene in 1974. Luau 5592 and Bounty 5592 feature the same recordings, but it must be said that Luau 5592 has never showed up anywhere as far as I know and the booklet of the Numero box “Boddie Recording Company: Cleveland, Ohio” doesn’t mention this release either. It shows eight Luau label scans and mentions a total of sixteen sides for the label, with no mention of the Friendly Brothers 45. There were more ‘Boddie’ (related) labels in the 1970’s which released gospel, like: Bos, J&W, Justine, LGS, Praise, RS and St. Teresa. The Effort for Christ Singers and the Happy Valley Singers are white country/sacred groups (releases on Bounty). The Gospel Mountaineers and the Huffman Trio could be white as well, but they’re in the Gospel Discography (Laughton/Hayes), so their records are listed. Apparently both releases seem to have the same catalog number. This page lists all known pre-1970 Bounty gospel releases (Bounty, Luau, Plaid and Soul Kitchen). 3 Plaid 145 Pronoun Gospel Singers Pray For Me, Mother b/w I Am Going Home 196?